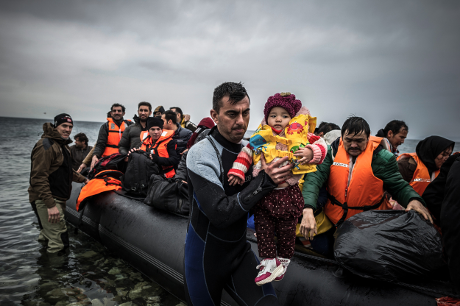 Migrants arrive in Mytilene, island of Lesbos, Greece, on February 24, 2016. Picture by NurPhoto/SIPA USA/PA Images. All rights reserved. Crossing the Syrian border into Turkey by foot took only a few hours, but they were so devilish we thought it was a lifetime, and almost died doing so. Others who crossed the border at the same time, only a few metres away from us, got shot and didn't make it. After a long and exhausting ride to the Aegean Sea in the west, we undertook another border crossing into the Greek islands on a miserable rubber boat. It was more like a swimming coffin than anything else. Along with forty other people, exhausted from shivering to the waves of the Aegean and fearing inevitable drowning, we spent these few hours holding our hands on our hearts. Reaching the shore of the islands was like a new birth, after barely surviving the shooting of the Turkish soldiers on the border with Syria. Thinking of the thousands of dead bodies which lay deep on the bottom of that sea as we crossed from one continent to the other, it was certainly a reincarnation. They didn't make it, and couldn't see the land of the Greeks or admire it as we did. As they crossed over the Aegean at night, the way everybody does, the dark shadows of the islands' shores might have been the only thing they saw. Perhaps they thought these shadows surrounding them were some forerunners of the angel of death, who came to get their souls in the middle of that dark frothing sea amid the darkest hour of their helplessness. it would have never occurred in our minds that life in a war could be more merciful and much kinder to us than the humiliation which surrounded us in Idomeni for more than three months. Arriving in Athens, at last, was somehow like arriving to a paradise on earth, as we still struggled with the shock of that sea crossing. We took a break for a few hours and then continued to the next border, reaching Idomeni, where the Macedonian borders were within walking distance. It was as if we had an appointment with another kind of life we never thought of before, since Macedonia had shut its borders only a few hours earlier. On land and sea borders we already crossed, we had to face death and got away with our lives, but it would have never occurred in our minds that life in a war could be more merciful and much kinder to us than the humiliation which surrounded us in Idomeni for more than three months. Those months passed like a perpetual lifetime with all the devils that exist. Weather conditions chose not to give us one lucky day and worked determinedly against our strong desire to get a day of rest, until those desires became an unrealisable dream. Rain, mud, and tents. Endless tents. Misery, darkness, wood, and fire. Cold, frost, wind, and storms. Misery, crying, shouting. Calls upon calls, with nobody answering. No way forward and no way back. The borders that had been opened by humans had been shut again by humans due to the orders of other members of the human species. No way forward and no way back. Our one and only loophole was the sky above us, which surely had delivered so many millions of prayers to God and every single angel above the earth. It took a long-time, but near the end of our time in Idomeni, an EU relocation program was started in Athens. So we went to the city, my wife and I, to make our applications to that program, which was supposed to get many thousands out of their miserable situation in Greece, and other European countries, and fairly dispense them among the willing countries of the European Union. This relocation program was surely a European act of solidarity to relieve European countries who were suffering from huge numbers of refugees after the Macedonian border was closed. Greece, especially, was crying out loud for the support and the solidarity of the other EU members. It also transferred many refugees from countries like Turkey and Lebanon. This program started in parallel to the EU deal with Turkey for a final and conclusive containment of illegal immigration from Turkey to Europe, and brought some other scourges upon Greece and the EU. With Turkey's failure to comply with its items, Erdogan's permanent threats to break the deal, created many tensions nobody needed but himself. Tensions grew more and more after the failed military coup in July 2016 and the issue of the Turkish pilots who fled to seek asylum in Greece afterwards. The Greek courts still don't want to send them back to Turkey, and Ankara is still asking the Greek government to do so. Due to the EU deal, Greece had now, as a member of the EU, an agreement with Turkey and another one with the EU itself to resettle as many refugees as possible. On the ground anyway, this wasn't yet implemented nor did it start working. The bureaucracy of the EU needed time to work. However, time was a true ally of the networks of human smugglers. On their overcrowded rubber boats, they shipped tens of thousands of refugees to the Greek islands in a very short period, with people now piled up on top of one another due to the limited capacities of the Greek islands. The dreams of many refugees to reach Europe will vanish eternally and pile up again in Turkey. Although the new arrangements between Turkey and the EU were clear about sending people back to Turkey, people still hoped they could somehow get through to other countries in the European Union. Those who made it to Greece were now facing one of two options: either get deported back to Turkey, or apply for asylum in Greece. Both options, once chosen, needed a lot of time to be implemented. With Greece and the EU having their new guidelines, but no working system, the refugees had now to live jammed together in overcrowded camps, which were never intended to receive such enormous numbers of people, multiplying their misery. With its broken economy, Greece took it upon itself to solve the world's biggest problem and handle the refugee issue, with the necessary help from friends. To tell the truth, the European Union showed no lack of solidarity concerning financial support to Greece, but it needs much more sustained efforts to get the job done, much more European labor power on the ground, and more relocated refugees to achieve any tangible relief. As for myself I heard again and again of delegations being sent to Greece to participate in solving the issue, but for all the ambitious, I did not see any decision made while I was still there. Many promises are still promises, while some new promises merely reiterate old objectives. The situation on the Greek islands is still difficult, but the situation on the mainland has become much better now than a few months ago. Homelessness is now scarcely to be seen and the refugee conditions are now generally much better than they were a few months ago. There are now more refugee accommodation centres across the country, they are better organised, and the services in these centres are far better than they used to be. The relocation program is now working more efficiently and the unique situation of each refugee is being considered. All in all, this has spared the refugees the suffering they had already experienced at other places, like Idomeni or the docks of Piraeus, that picturesque port city within the Athens urban area, that I myself got to know for a short period of time before being moved to the Oniro Hotel. In March, the EU will reactivate the Dublin Regulation again, for Greece anyway. That means that the dreams of many refugees to reach Europe will vanish eternally and pile up again in Turkey, who already hosts several million. The main point is that they are not in the EU any more. Germany is not only pushing for that, due to its elections this year, but also for another solution for the Greek debts and an end to the help programs, although Greece is meeting all its obligations on both fronts. As for the refugees, Greece is still working to better their lives. In March of this year, they will be granted a certain amount of money to buy their own food, instead of getting free meals, and this amount of money is equal to what Greek families get to cover such costs. The Greeks are spending EU money the right way, and the Turks are ducking and threatening the whole time, becoming a nightmare the European leaders don't want to acknowledge. As to the overwhelming debt problem of Greece, Germany seems to be trying to push for another answer to this problem after the differences between the EU commission and the IMF have come to a point of no agreement. The IMF insists that Greek debts must be cut before the IMF participates in the third bailout package. The EU commission doesn't even want to discuss this issue. As for my wife and myself, we were two of the lucky refugees who were resettled after being chosen through the authorities of the Netherlands, and we are now living in the beautiful city of The Hague. We hope this is the last destination on our perilous journey, and wish that our memories of the war, and the journey from Syria to The Hague, will somehow become more bearable in the near future. Translated by Salim El-Jafari, Cologne.